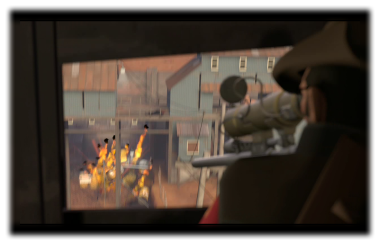 The Team Fortress 2 Indie Rumble! was put together to provide independent video game developers an organized, casual yet still competitive environment to play TF2. With the help and support of ModDB, we hope to bring developers closer together by arming each and every one of them with a baseball bat, axe, bonesaw or other bludgeoning tool, tossing them in a closed arena and encouraging them to duke it out. The Indie Rumble! is invitation-only. We would like to get 16 teams involved for Season Zero of the league. Indie Rumble! Nominate Your Favorite Teams..
Click here for the Indie Rumble! Round Zero Recap! We have a list of a dozen other teams we will be inviting. We encourage the community to nominate more teams. Don't forget to track this group! Click here to read the rest of the Indie Rumble! Blog..
Indie Rumble! Round Zero Recap.. The first Indie Rumble! was a blast. For a trial run, it went as well as could be expected. Developers and testers from the Iron Grip: Warlord game and the Pirates, Vikings and Knights II mod took part in the event. We are now working hard to turn the Indie Rumble! into a weekly show. Expect to see 16 Mod and Indie teams participating in Season Zero which we hope to launch at the beginning of October. As our amazing announcer, Chris Schetter, said that day: "We are practically constipated with content. We have so much, we can't even get it all out". So, for those of you who could not attend the pilot, or for those who did and want to check out some of the parts we had to cut out (see audio interviews), worry not! We have everything recorded and available to be streamed and viewed right in this very post. The Iron Grip story and development process, the business aspect of forming an Indie development team, the switch from Source to id Tech 3, how to get involved in the Beta, information about an Iron Grip: Warlord demo, downloadable content and much, much more! Talk about Ninjas, Orange Box features, new classes and weapons, melee combat, Parrot naming, advice for startup Source mod teams, CHUCK NORRIS and more! We hope you have enjoyed this first of many Indie Rumble! broadcasts. Stay tuned for news of the next show. Track our group and you won't miss it! Indie Rumble! Pirates, Vikings and.. Warlords? What happens when a bunch of Warlords get lost and find themselves surrounded by a group of Pirates, Vikings and Knights? Utter Mayhem. Don't take my word for it, tune in this Sunday at 3:30pm Eastern (UTC -0400) to our live broadcast of the first ever Indie Rumble! Click Here for the Event's Recap! The team behind MidEast Crisis and Iron Grip will be battling the developers of Pirates, Vikings and Knights during the trial run of our brand new league. As an extra treat, we'll be airing two fresh out of the oven interviews as well as exclusive in-game footage and a few other surprises. Don't miss it! Watch the group to be notified as soon as the broadcast goes live. Also, let us know who you think will win the brawl. We hope to see you all on Sunday! Bring popcorn (and lots of sandviches for the Isotx team). Indie Rumble! Update, Public Servers..
Mark your calendars boys and girls, the Indie Rumble! kicks off this Sunday at 3:30pm Eastern (UTC -0400). We will be posting the details of the event and announcing the two participants to this weekend's trial match later this afternoon or early tomorrow morning. If you aren't already, you should be watching this group. You'll also be seeing a lot of changes to the group's profile over the next few days. We're slowly perfecting the profile's layout and design and adding information like schedules and rules. We just finished embedding the players that you will use to watch the event (click the broadcast link at the top of the profile). We're going to be testing the stream a few more times, if you're lucky (or unlucky) enough, you might catch us (not really "us", more like Chris Schetter) doing some wacky (zany?) things on air (at least, I hope)(pray that he's wearing pants)(that is all). On a side note, we're slowly opening the doors to a few public TF2 servers. Join us for a little fun, you never know which developer you'll have the chance to beat up in game (but when you do, be sure to brag about it)! A big thanks to Trinity Gaming for providing over 10 massively powerful TF2 servers for the Indie Rumble! Ever wonder what the guys at Valve, Bioware and Blizzard do during their lunch hours? They compete in what is lovingly called the Studio Rumble (they don't believe in food). This invitation-only gaming league pits development studios against one another in one of the most wacky and entertaining multiplayer games out today, Team Fortress 2. While the big boys may have forgotten about us "mere modders" and "small indies", ModDB sure hasn't. ModDB knows that nothing brings developers closer together like the chance to hit one another upside the head with baseball bats. And so, with their support, as well as help from TGBF and Trinity Gaming, we'd like to announce the creation of our own league, the Team Fortress 2 Indie Rumble! What about the fans, you say? We want to get the entire community involved by allowing them to pick what they believe will be the match of the week. That match will be broadcast live with play-by-play commentary by one of gaming's finest, Chris Schetter. The way we see it, it's that much more fun to knock someone out with the Killing Gloves of Boxing when your entire fanbase can be watching it and cheering you on. As a special treat to them, we'll also be airing interviews with the development teams, exclusive in-game footage during half-time, and anything else Chris and the rest of the production team can put together and toss on the air during the hour-long weekly event. Season Zero will launch with 16 development teams in just over three weeks. We're currently in the process of working out the details and hope to bring you a "trial run" of the entire show this Sunday afternoon. Track this group to be notified of updates! Which development teams would you love to watch "duking it out"? Post your comments!